The Impreza sedan does not come from the factory with roof rails and the ‘06 STi does not have a passthrough or 60/40 split rear seat (‘07 added a passthrough). So without doing anything custom, you are pretty stuck when it comes to transporting skiis. 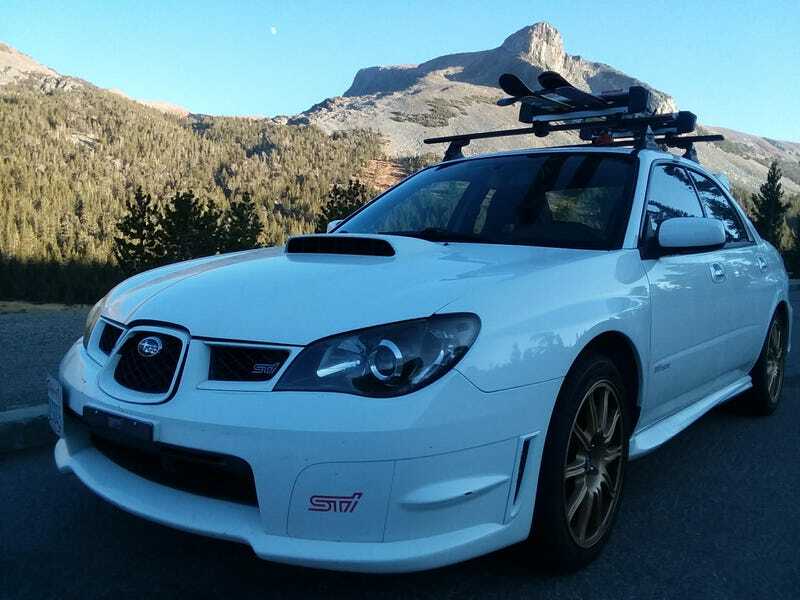 After much consideration about how to transport skiis with my Subaru, I finally setlled on a Yakima roof rack system. First bit of install was the most difficult part due to the aforementioned lack of factory roof rails on the Sedan (part of why I wanted an unobtainium wagon). I followed some guides I found online of drilling and tapping my own holes into the roof. There are little brackets in the rain rail (underneath the black strips on the roof) but the already drilled holes do not line up with each other nor are they tapped for any particular screw. Once I removed the rain rail covers, it was pretty simple to just measure things and drill new holes. However, I learned some lessons in using a tap and that it required some effort to align things properly. After cross threading 2 bolts and having to re-drill and re-tap in larger sizes, I have learned those lessons the hard way! The semi-permanent landing pads were then an easy bolt in (with various sized bolts and bolt heads, none of which hardware came with the ‘08 impreza landing pads I had to use). In order to remove the pads I would have to find a way to plug the rain rail covers or replace the covers entirely. But either way, that part was done! The next part was pretty easy as it was just a shopping spree followed by a bunch of simple assembly and mounting to the car. I had bought the Skyline Towers, 50" JetStream bars, and the Freshtrack4 ski rack. After unboxing, I just put everything together in my living room before fitting it to the car. All I had to do for the install onto the car was pop off the covers on the landing pads, align the skyline towers to get the lengths right, and then install the SKS locks to secure it all in place. And when I get home from a ski trip, its a simple unlock and remove for the whole system, leaving just the landing pads in place. For security, the SKS locks holding the towers/bars to the pads seem pretty secure to me. The only way to wrangle those off would be to somehow rip the bolts out from the car (maybe with a really big pry bar and a lot of force?) or power tools to drill out the locks. This could be solved with more secure mounts but that would be a much more custom install. The ski racks also have SKS locks but the whole rack itself is mounted to the bars with a screw clamp only secured by a security allen screw. Any bozo can go to home depot and buy a security allen key set. So idk how secure I feel that is. It is definitely enough deter the casual thief which is good enough for now. Something to look into though if I ever get nice skiis that would be a real detriment to lose. Overall, I like how easy everything was to install and the rack is perfect for 2-3 sets of skiis or 2 skis and a snowboard. Sure it is rated to fit 4 sets of skiis or 2 snowboards but damn would that be difficult and a tight fit for anything bigger than racing skiis. I also like that I have room to mount something else on the roof, like a bike or a small enclosed case, so I have some room for improvement. Either way, it sure beats removing the back seat and clogging up the whole interior with my skiis.